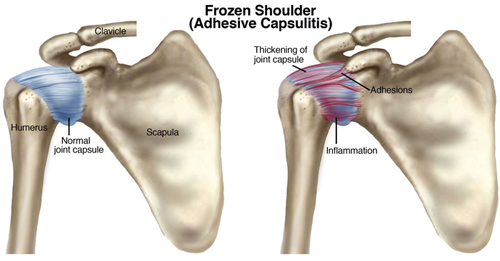 Frozen shoulder, also called adhesive capsulitis, is a disorder in which the glenohumeral (shoulder) joint capsule becomes stiff and inflamed. The process greatly restricts normal shoulder movement and leads to severe pain and impairment. 1. Primary: Begins without a clear mechanism of injury. 2. Secondary: Occurs in response to a trauma or injury. These events often include: rotator cuff impingement, bursitis, AC separation, or nerve injury. 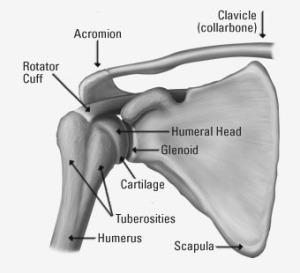 The shoulder joint or glenohumeral joint is a synovial ball and socket joint. It is formed by the articulation between the glenoid cavity of the scapula (shoulder blade) and the head of the humerus (upper arm bone). The shoulder joint or glenohumeral joint is a synovial ball and socket joint. It is formed by the articulation between the glenoid cavity of the scapula (shoulder blade) and the head of the humerus (upper arm bone). The glenhoumeral joint is surrounded by a joint capsule, which is vital for function. The capsule is a dense fibrous connective tissue that forms a sleeve around the joint and provides stability. The capsule may be injured leading to laxity, constriction or adhesion to the surrounding tissues. Painful and restricted movement of the shoulder. Pain around the shoulder and into the upper arm (deltoid region). Night pain. Pain into the side of the shoulder and upper arm. Aggravated by end range movement of the shoulder. Range of motion is minimally restricted. May have pain at rest. Pain level is decreased vs. stage I. Progressive range of motion limitations. Activities of daily living are severely limited. Pain into upper shoulder, arm and possibly into wrist. Pain with or without movement. Range of motion progressively increases. Unable to lie on affected shoulder. Frozen shoulder is considered a self-limiting condition, which means that most people will have full resolution within 2-3 years. In spite of this, patients who receive no treatment may have long-term range of motion deficits, pain and disability. There is evidence to suggest that various treatments, including mobilization, muscle energy techniques, manipulation and soft-tissue therapy can decrease the time frame for healing and lessen range of motion deficits. At Mountain Health & Performance we provide the following treatments for Frozen Shoulder. One of the hallmarks of frozen shoulder is extreme limitation in shoulder range of motion, especially in external rotation. This range of motion is necessary for overhead movements and activities. Adhesions in the capsule along with shortening of the rotator cuff muscles and pain leads to this limitation in movement. Muscle energy technique is a manual therapy in which patients actively contract their muscles against a counterforce in a precisely controlled direction. It is safe, anti-inflammatory and helps improve strength and range of motion when used in the correct way. Studies have shown that mobilization with the addition of muscle energy techniques significantly improve range of motion and pain. Mobilization is a slow controlled hands-on technique that helps to stretch the joints and joint capsules. Because Frozen shoulder is primarily a joint capsule issue mobilization is extremely effective at reducing pain and improving mobility in the long-run. Manipulation of the neck, ribs and or middle back has been shown to improve mobility and pain in those with adhesive capsulitis. This effect may be explained, in part, by the joint-by-joint approach. The joint-by-joint states that each joint in the body should have a certain amount of mobility to function optimally. If one joint does not have adequate mobility the body will compensate by searching for that mobility somewhere else (i.e. : the surrounding joints). For example a stiff upper/middle back (thoracic spine) can manifest as neck and or shoulder pain/injury. This is why it is important to optimize the function of the joints surrounding the primary joint that is injured or painful. Chiropractic manipulation provides immediate improvements in joint function and range of motion and when followed up by the correct exercises will provide lasting results. Chiropractic manipulation also has an effect on the nervous system, which can help, decrease pain and relax surrounding muscle tension. Though we do not utilize high velocity manipulation on the shoulder joint, manipulation of the surrounding areas (neck, middle back, upper back) can have a profound effect on the shoulder joint and the pain associated with frozen shoulder. Frozen shoulder is the result of adhesions, which form in the shoulder joint capsule. The capsule itself becomes extremely tight and limited which affects the function of the shoulder and surrounding joints and soft-tissues. Oftentimes the rotator cuff and other muscles surrounding the shoulder become tight as well. Myofascial release techniques can help to normalize the mobility of the capsule and surrounding muscles and fascia. The hands-on fascial work helps the body to break down scar tissue and adhesion and guides the creation of new fascia and connective tissue, which moves and glides normally. Laser therapy, also known as phototherapy, is a non-invasive application of laser light. Laser therapy helps to repair damaged connective tissue, reduces inflammation and decreases pain. In cases of frozen shoulder laser therapy can help to speed up the healing process through the means above. Studies have found that participants with frozen shoulder who received laser therapy experienced decreased shoulder and upper extremity pain and disability. Range of motion was also improved, though not as dramatically.